State-level data show the difference in crude oil API gravity in different parts of the country. For example, oil produced in Texas has a relatively broad distribution of API gravities, with most production ranging from 30–50 degrees API. Oil produced in North Dakota tends to be light (less dense). 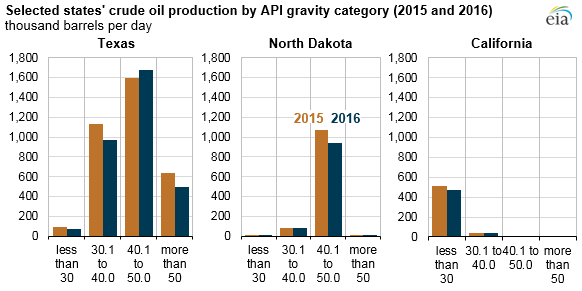 About 90% of North Dakota’s oil production has an API gravity of 40.1–50.0 degrees. California’s oil is mostly heavy (more dense), and more than 90% has an API gravity of less than 30 degrees. Domestic crude oil production has grown rapidly since 2010, primarily because of light crude oil produced from low-permeability (tight) formations. EIA’s Annual Energy Outlook 2017 Reference case projects that U.S. tight oil production will increase in the coming decade, accounting for most of total U.S. oil production. U.S. oil production increases over 2010–15 were driven by technological improvements that have reduced drilling costs and improved drilling efficiency in major shale plays such as the Bakken (North Dakota), Permian Basin (Texas and New Mexico), and Eagle Ford (Texas). The increased production in these areas has resulted in a greater share of Lower 48 production having an API gravity of 40 or higher. EIA has now collected two years of API gravity data through its monthly survey of operators in major oil-producing states, which helps inform analysis of refinery inputs and utilization, crude oil trade, and regional crude oil pricing. EIA’s Monthly Crude Oil and Natural Gas Production Report collects production data from oil and natural gas well operators in 15 individual states and the Federal Offshore Gulf of Mexico.